More issues with iTunes 12. Lots of readers are writing in with questions about iTunes 12 and its quirks. In this week’s column, I explain how to import single tracks from CDs, which is different in the latest version of iTunes. I look at the iCloud Download column that displays in list views. I try and explain why Apple Music’s music files have DRM. 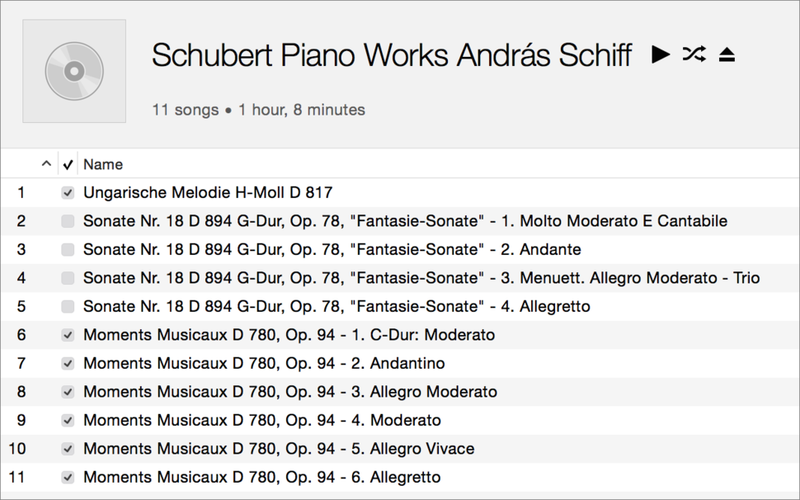 And I highlight a bug in the way iTunes displays some information about playlists. Q: Sometimes I want to rip just a few tracks on a CD, not the entire disc. Previously, you could drag and drop tracks from a CD right onto the Music library. Now, you can only add a track to a playlist. Is there any other way to import just one track? Prior to iTunes 12, the sidebar displayed the selected library (Music, Movies, etc.) and its playlists. Dragging one or more tracks from a CD to the top of that sidebar added those tracks to the Music library. As the reader points out, you can no longer do this. In iTunes 12, when you view a CD, you don’t see a sidebar. But if you drag tracks to the left edge of the window, a sidebar slides over. However, there is no Music library in the sidebar; just your playlists. You can drag one or more tracks to a playlist, but only to a playlist. This is actually how I usually rip CDs. I add them to a playlist called Temp, where I can change their tags and add album art. Doing this, I don’t have to search for the files in my library. If you do want to import one or more tracks and not an entire CD, what you can do is uncheck the tracks you don’t want to import. Click Import CD and iTunes will only import the checked tracks. 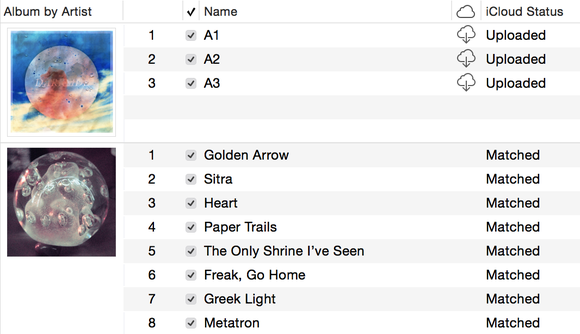 Note the checkboxes to the left of the track names when viewing a CD in iTunes. Click Import CD at the top right of the iTunes window and iTunes will import the checked tracks only. Q: Is there was any way to remove the iCloud Download column from iTunes? The iCloud Download column this reader is referring to is the one with the cloud in the column header in the screenshot below. The iCloud Download column tells you which files are physically on your computer. This column shows, in list views, which files are on your computer, and which are in the cloud. When a file is in the cloud, you see the cloud-with-arrow icon in that column; when files are on your computer, that column is empty. You can hide that column by clicking the View Options menu—it’s the popover at the top right of the iTunes window, and, in list view for music, it should say Songs. Click Show Columns, and then select iCloud Download to uncheck it and hide it. However, if you quit and relaunch iTunes, that column will display again. The only way to hide it permanently is to turn off iCloud Music Library in iTunes’ General preferences. If you do this, however, you won’t have access to any of your music in the cloud. If all your music is on your computer, you can turn off iCloud Music Library, but then changes you make to your iTunes library won’t sync to your other devices. Q: I subscribe to both iTunes Match and Apple Music, and, from what I have read, songs that I download from Apple Music should be DRM free. However, that hasn’t been the case. Can you explain? There is a great deal of confusion surrounding Apple Music and digital rights management (DRM). Also, Apple has made it very hard to understand how iTunes Match works together with Apple Music. I have written about this here, explaining how the two services work together. In short, music that you add to your library—music you have ripped from CDs, or downloaded from elsewhere—gets matched or uploaded to iCloud Music Library. If you have an iTunes Match subscription, the files you later download will not have DRM. If you only have an Apple Music subscription, however, your original files will not be changed, but if you download matched files later on the same computer after deleting them, or on a different computer, they will have DRM. You can also add music to your library from Apple Music. 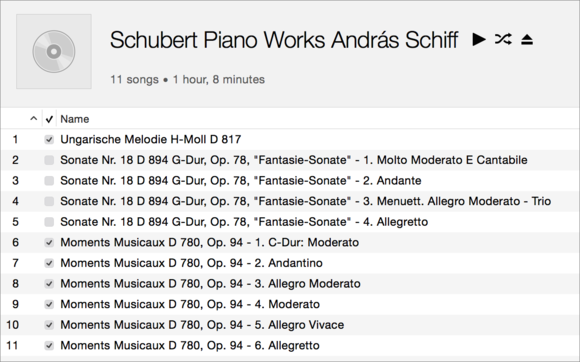 You can play this music, add it to playlists, and sync it to iOS devices. However, you are only renting this music; you are allowed to use it only as long as your Apple Music subscription is active. As such, these files do have DRM, and should have DRM since they do not belong to you. Q: Since iTunes 12.2, I can no longer toggle between showing the playlist length in minutes (rounded up) to minutes with seconds on new playlists. This is very important since I teach dance fitness and seconds count. Can you help me? I assume that when you talk about the time toggling, you mean in the status bar at the bottom of the iTunes window. If you display the status bar—choose View > Show Status Bar in iTunes—it shows how many songs are in a playlist, its total time, and the space the files take up. If you click this text, it toggles, as you say, between a rounded time and an exact time with seconds. Above: a playlist showing minutes and seconds. Below: the same playlist rounded to minutes. I tested this and I can confirm that new playlists don’t toggle the time. 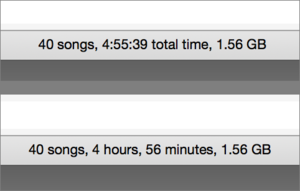 Playlists in my library that predate iTunes 12.2 toggle the time correctly, but new playlists I create don’t change from the rounded times. I assume this is a bug, and I really don’t have any workarounds to offer. I’ve filed a bug report with Apple.